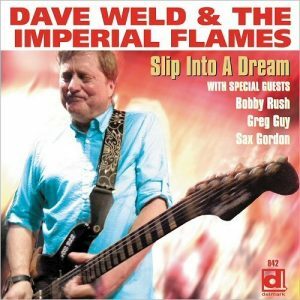 Slip Into A Dream, by Dave Weld and the Imperial Flames, is a fine way to soak up and enjoy good old Chicago blues. The album walks a fine line between raw in your face blues and a slow jam feel. Listeners are instantly transports the listener to a crowded, dimly lit smoke filled blues club in the windy city. The title track, features Graham Guest on organ providing a dreamy vibe, perfectly complimenting Weld’s spot on guitar riffs. Weld lights it up on “May Be Right, May Be Wrong,” which also features Monica Myhre sharing lead vocals. At about two minutes in, Weld blows the roof off the joint with his guitar solo before handing it off to Myhre. Dave Kaye adds to this celebration with a strong walking bass line. “Looking for a Man” is the classic “I can’t find the right love” song. Monica Myhre shares her strong vocals alongside the legendary Bobby Rush. With “Sweet Love,” we are once again treated to the voice of Monica Myhre who gets her groove on in this soulful, rhythmic number that hearkens back to the 1970s. “Sweet Love” is yet another fine example of the wide vocal range Myhre performs throughout the album. This album provides varying snapshots of Chicago blues, leaving a listener hard pressed to decide on a single favorite! If Chicago blues is your scene, then Slip Into A Dream is just the ticket. Pick up your copy today!